How do they perceive sounds? How do they store words? Learn about a special group of bilinguals. Tonal bilinguals of two closely related Chinese dialects are amazing people. They handle two tonal systems in their mind; their two vocabularies are from closely related dialects, and they write translation equivalents with common Chinese characters. Their unique language situation makes their mind special. This thesis investigates these tonal bilinguals’ lexical processing mechanism, studying how they produce and understand words. Their situation provides a valuable test case for a few important theories on bilingual lexical access. Bilingual lexical processing is flexible, influenced by the task and language mode. 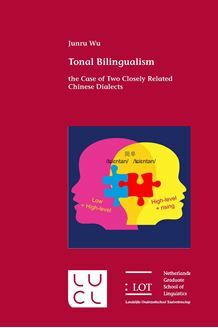 Moreover, compared with tonal monolinguals, these tonal bilinguals not only showed classical advantages in executive control, but sometimes even perform faster with lexical tasks. The structure of the bilingual lexicon can cause important differences in bilingual lexical processing and the corresponding functions of executive control.